constable Coram was my Grandfather. I was to young to remember him when he was killed. Grandmother told me many stories of his life and his love of family. It must have been a great love,for Grandmother never remarried. I wish I could have gotten to know you Grand Dad. Rest in peace Constable Coram. Even back in your day ignominious acts of violence did occur tragically. Your service was appreciated. Wayne Coram was also my great grandfather. I have heard the stories which have been passed down through my family about our strong lineage in law enforcement. My grandfather, Lloyd Coram, also served in law enforcement at the Panama City Police Department. My father, Charles Coram, also served with the Panama City Police Department as well as the United States Army. Two of my uncles, Joe Coram and Don Coram, after their military service also served at the Panama City Police Department and the Bay County Sheriff's Office. My Uncle Joe was named the Law Enforcement Officer of the Year for the State of Florida in 1983. I am proud to serve as a fourth generation law enforcement officer in Bay County and carry on the tradition which my great grandfather set forth. Constable Wayne Coram was my great grandfather. My father has shared many stories about him and is still missed to this day. Being a veteran Law Enforcement Officer myself, I am proud to carry on the tradition set fourth by Constable Coram. 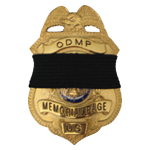 Rest in Peace, Constable Coram. Your sacrifice is not forgotten. Thank you Constable Coram for your dedication, service and protection to us all. We will never forget the sacrifice that you made for us. Continue to rest in peace Constable Coram. REST IN PEACE, YOU SERVED WELL. Todayd on the anniversary of yoru death we wish to remember you and thank you Sir for your service. Rest in peace brave officer. You will not be forgotten.